If ur preparing the next day and if the dough is hard,u can add little milk and it becomes soft and can make adirasam. While frying,when we heat oil it should not heated more or less.medium heat of oil is to be noted. Wash and soak rice in water for 2 hours.Drain the water. In a cloth spread the rice and when it is half dry, grind it in the mixer to a nice powder.Sieve it once. In a pan,add water.when it boils add jaggery.It dissolves & when syrup bubbles keep in low flame till it reaches (paagu) thick syrup stage, please test the consistency in a small cup. When u put the paagu or thick syrup into the water,u should be able to make a soft ball not a hard one, it is the right (thakali pazham) consistency. Remove from flame & add elaichi powder,rice flour gradually to the thick syrup of jaggery and mix constantly till it forms a dough. Knead like puran poli or bholi dough.Dough should be slightly loose. when it cools down, it will become hard. Apply ghee. Keep it aside for 2 hrs or u can make the next day and store in air tight container. Take a small ball sized dough and flatten it in plastic sheet (apply little oil or ghee)or in banana leaf to round shape.Dough should not break. Heat oil in the kadai and it should be medium flame put only one adirasam at a time and deep fry both sides to golden brown. Drain the excess oil by placing adirasam in between two plates or cups.Nowadays to drain the oil,wooden adirasam oil drainer is available in the market.u can drain adirasam with that.The more oil is drained the crispy it will be. Don't put one above the other.spread it and when it is cooled down,store it in air tight container. Crispy and soft adirasam is ready. Note:U can pour rice flour into jaggery ,keep 1 scoop of syrup separately. if needed u can add to the flour.or can pour jaggery syrup into rice flour.keep a scoop of rice flour separately.if sweetness is more,can add rice flour to it. 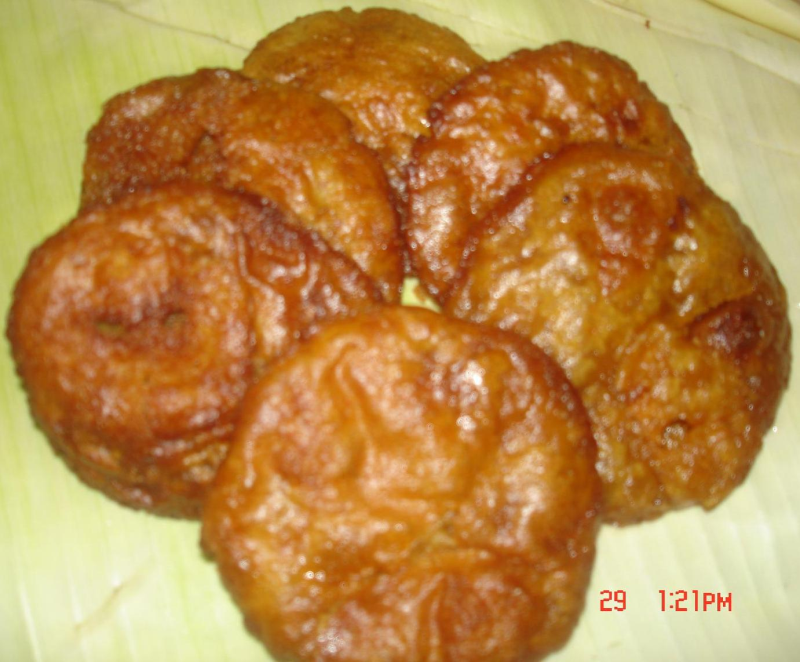 halo rajeswari...this is really an awesome sweet.thanks for the recipe. will surely try this out. Dear Soujanya,Keep the dough in upitu/bholi consistency so that it will not break.u try this way.jaggery is heaped.Please gothrough my note also. Keep the dough in poli(upitu/bholi) consistency so that it will not break.u try this way.jaggery is heaped. Hi Rajeswari...this is my favourite sweet. Aft my grandmom passed away, i hv never eaten it cos whenever i make it, it breaks. Will definately try urs. Just 1 question..do we hv 2 take Rice also heapful like Jaggery? Dear Rabz & Christy,Thank you so much for ur votes and comments. Rajeswari!Wonderful recipe indeed. (u might have spend little time to type this one).Good work!. Thanks Rajeshwari , we call them Pitha & they are so yummy.